A play like “Tiny Beautiful Things” is simple in concept but difficult to pull off. With little action, it’s success hinges on the craft and credibility of the actors and script. However, Nia Vardalos’ adaptation of author Cheryl Strayed’s work manages to effectively balance the material’s emotional punch with enough humor to keep the audience at the Pasadena Playhouse, where the Public Theater’s production just opened, engaged throughout. The show was conceived by Vardalos (writer and star of “My Big Fat Greek Wedding”), Thomas Kail (who directed “Hamilton”), and journalist Marshall Heyman. 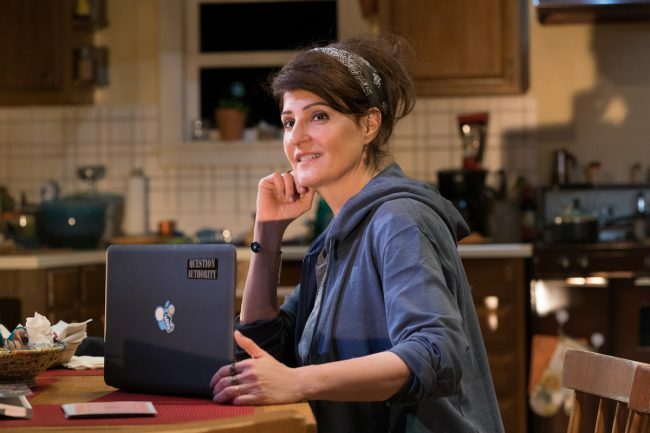 It is based on Strayed’s “Dear Sugar” advice column, which she wrote while working on “Wild: From Lost to Found on the Pacific Crest Trail.” Those advice letters eventually became a book, “Tiny Beautiful Things.” They then were adapted into this play, which debuted Off-Broadway in 2016 with Vardalos portraying Sugar/Strayed. Faced with such melodrama and sadness leads Strayed/Sugar to give uplifting advice on forgiveness, learning to love and accept loss, and moving on. Her heartfelt and compassionate counsel clearly hits home for her, too. She recognizes the value of reaching out when you are stuck. and taking on difficult questions which require equally difficult answers. The play and plot could seem tedious to some for lack of action. Set in Sugar’s home, the plot consists of her listening to the questions posed by readers, voiced aloud with great feeling by Teddy Cañez, Natalie Woolams-Torres and Giovanni Adams, and responding to them orally. Vardalos’ “Tiny Beautiful Things” is at the Pasadena Playhouse in the greater Los Angeles area through May 5, 2019. It is also scheduled to open in Chicago later this year. Because of scheduling issues. Nia Vardalos will not be appearing at any of the matinee performances or on the final night in the Pasadena run of “Tiny Beautiful Things.” Vardalos’ understudy, Sameerah Luqmaan-Harris, will perform in those shows.